Felix Rosier is a fourth-year wizard at Hogwarts School for Witchcraft and Wizardry. He began his studies at Hogwarts in 1980, and became the Slytherin Prefect in 1984, meaning he was responsible for watching over the first year students. The Rosier family is rather notorious in the world of magic. They are a pure-blood wizard family and even have ties with the Black, Lestrange and Malfoy families. Members of this family have been members of the infamous Death Eaters in the past, a radical group of witches and wizards led by Lord Voldemort that sought to end the Muggle-born race and preserve the purity of the wizard bloodline. Considering all of this, it is no wonder Felix was sorted into Slytherin. However, while he may have a malevolent appearance, he does seem to be as dangerous as his father, who fought in the First Wizarding War as a Death Eater. Felix first appears in the game in the second year. He is one of the obstacles you have to overcome in order to enter the Slytherin Common Room. Luckily, you don’t have to duel him, which would probably be a fatal mistake. You and Rowan come up with a plan to distract him while you sneak in and out quickly. 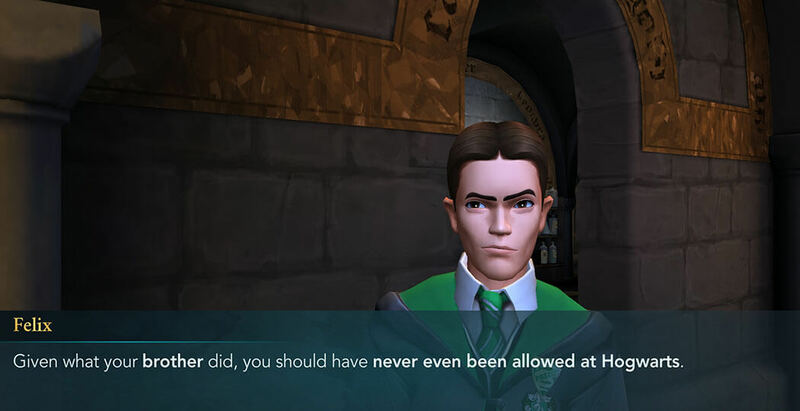 Chapter Two: After finding a Secret Note in the Artifact Room, you need to sneak into the Slytherin Common Room to retrieve a Black Quill as instructed. Aside from the locked door, the other obstacle in your path is Felix Rosier, the Slytherin Prefect. You thought you could sneak inside while everyone was at the Quidditch match, but Felix is being very diligent and keeping guard. You play dumb and tell him Gryffindor is planning a massive prank on Slytherin during the match and he falls for it. He is distracted just long enough for you to go in, get the quill and get out.